Concept – The inspriation came from working with older computers that were being utilized by a company as servers. 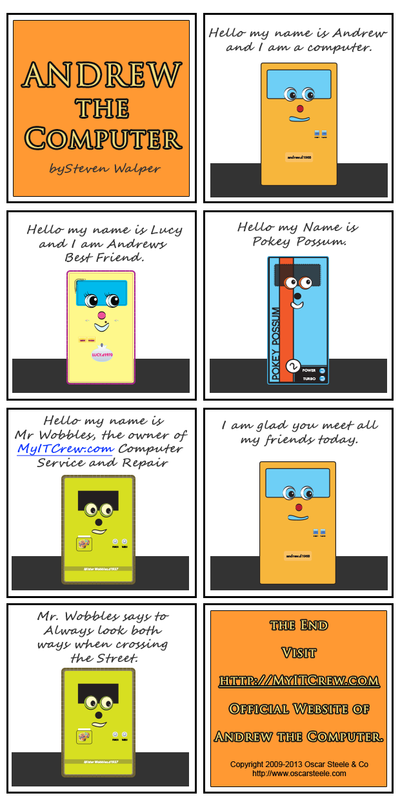 Each computer had unique names such as Pokey Possum and Mister Wobbles. In late 2008 I drew out the first drawing of “Andrew the Computer” on a sheet of notebook paper. I scanned the image in a created Andrew the Computer digitally. Today there are 4 existing character for “Andrew the Computer” and one more planned. In 2013 I have started to clean up each character and working on finishing one of three Children’s Storybooks. Below you will find the start of the images completed. Would love to hear your feedback on my work.